This is a list of Prime Ministers of Japan, including those of the Empire of Japan, from when the first Japanese prime minister (in the modern sense), Itō Hirobumi, took office in 1885, until the present day. The office is currently held by Shinzō Abe. Those Prime Ministers under the Meiji Constitution had a mandate from the Emperor. The "electoral mandates" shown are for the lower house of the Imperial Diet that was not constitutionally guaranteed to have any influence on the appointment of the Prime Minister. Multiple terms in office, consecutive or otherwise, are listed and counted in the first column (administration number) and the second column counts individuals. For example, Hatoyama Yukio is listed as the 60th individual to hold the office of prime minister, while his first cabinet is the 93rd since Itō Hirobumi. The office of Daijō-daijin (太政大臣, Chancellor of the Realm of Japan) was the equivalent of what would become the office of Prime Minister. It was an ancient role that had been discontinued in the 18th century and was briefly revived under the Meiji constitution. The office of Daijō-daijin was abolished in December 1885 with the appointment of Itō Hirobumi in the new position of Prime Minister. The first Prime Minister of the Empire of Japan. Oversaw promulgation of the Meiji Constitution. Failed to secure revision of the unequal treaties; resigned. Upon the resignation of Kuroda’s government, the Emperor only accepted Kuroda’s resignation and invited Sanjō to head the government for two more months. Today, however, Sanjō’s government is generally regarded as a continuation of Kuroda’s. Held concurrently by the Lord Keeper of the Privy Seal. He had previously held the office of Daijō-daijin, or chancellor of the Realm, the predecessor office of the Prime Ministership. During this interval, Privy Council Chairman Kuroda Kiyotaka (黑田 清隆 Kuroda Kiyotaka) was the Acting Prime Minister. During this interval, Privy Council Chairman Saionji Kinmochi (西園寺 公望 Saionji Kinmochi) was the Acting Prime Minister. During this interval, Foreign Minister Uchida Kosai (内田 康哉 Uchida Kōsai) was the Acting Prime Minister. Resigned after the "Grand Coalition of the Three Pro-Constitution Parties" collapsed. Katō was then reinvited by the Prince Regent to form a new government with his own party, Kenseitō. Today, however, his second term is generally regarded as continuation of his first. Died in office of natural causes. During this interval, Interior Minister Wakatsuki Reijirō (若槻 禮次郎 Wakatsuki Reijirō) was the Acting Prime Minister. Incapacitated due to serious wound from assassination plot on 14 November 1930. Foreign Minister Kijūrō Shidehara served as Deputy Prime Minister until Hamaguchi’s return to the office on 10 March 1931. Invasion of Manchuria, official start of World War II in Asia. During this interval, Finance Minister Takahashi Korekiyo (高橋 是淸 Takahashi Korekiyo) was the Acting Prime Minister. Thought to be killed by renegade soldiers during the February 26 Incident. Interior Minister Gotō Fumio served as Deputy Prime Minister until Okada was found alive on 28 February 1936. War Criminal; executed in 1948. War Criminal; died in prison. War Criminal: Committed suicide in 1945 rather than face arrest. War Criminal: Died in Prison. The only member of the Imperial Family to serve as Prime Minister. Under Allied Occupation. The first Prime Minister and the first socialist to serve as Prime Minister of Japan. Member of Diet from 1930 to 1963. Formed a coalition government with the Democratic Party and the National Cooperative Party. Under Allied Occupation. Ashida's cabinet resigned after seven months in office, due to alleged ministerial corruption in the Showa Electric scandal. Under Allied Occupation until the Treaty of San Francisco came into force on 28 April 1952. Developed the Yoshida Doctrine, prioritising economic development and reliance on United States military protection. Rebuilt diplomatic ties with the Soviet Union. Favored parole for some of the Class A war criminals who had been sentenced to life imprisonment at the Tokyo Trial. Incapacitated due to minor stroke on 31 January 1957. Foreign Minister Kishi Nobusuke served as Deputy Prime Minister until 25 February 1957.
resigned in the midst of scandal. Later, "shadow shogun". During this interval, Chief Cabinet Secretary Masayoshi Ito (伊東 正義 Itō Masayoshi) was the Acting Prime Minister. The Recruit scandal forced his resignation in 1989. Later "Shadow Shogun." Soon after he was elected Prime Minister, allegations arose that he had an extramarital relationship with a geisha, which damaged his reputation and his party's bad performance in the 1989 House of Councillors election, for which he resigned. Served as Minister of Defense (1974), Chief of the Science and Technology Agency (1976–1977), Chief of the Civil Administration Agency (1979–1980), Minister of Economy, Trade and Industry (1983), and Minister for Foreign Affairs (1987–1989). Member of the Diet from 1960 to 1996. Defeated in 2009, he was the longest-serving member of the lower house of the Diet, and he was also the first former prime minister to be defeated at a re-election since 1963. Served as Deputy Chief Cabinet Secretary (1974–1976), Minister of Education (1976–1977, 1985–1986). Member of the Diet from 1960 to 2009. Originally a bureaucrat in the Treasury Ministry, he accompanied Prime Minister Shigeru Yoshida at the Treaty of San Francisco. A firm critic of the revision of the constitution, he advocated peace throughout his political career. After his party's stunning defeat in the 1993 general election, he was forced to resign the Prime Ministership, but became Minister of Finance in the cabinet of Keizo Obuchi and Yoshiro Mori from 1998 to 2001. He died in 2007. Served as Minister of Economy, Trade and Industry (1962–1964, 1966–1968, 1970–1971, 1977–1978), Chief Cabinet Secretary (1980–1982), Minister of Finance (1986–1988), Minister of Posts and Telecommunications (1993) and Minister of Agriculture, Forestry and Fisheries (1993). Member of the House of Councillors (1952–1965). Member of the House of Representatives (1967–2003). He is a member of a noble family that ruled Kumamoto since Medieval times, and during Imperial Japan, his family was part of the aristocracy, his grandfather Konoe Fumimaro having served as Prime Minister (1937–1939, 1940–1941). Originally member of the Liberal Democratic Party, he left the party in 1992 to form the Japan New Party, which garnered 35 members in the 1993 general election. He served as Prime Minister in 8-party coalition government and spearheaded a reform to change the electoral system. He resigned after allegations arose that he had misused personal funds in the 1980s. Served as Governor of Kumamoto Prefecture (1983–1991). Member of the House of Councilors from 1971 to 1983 and 1992 to 1993. Member of the House of Representatives from 1993 to 1998. Originally member of the Liberal Democratic Party, he left the party in 1993 with Ichirō Ozawa to establish the Japan Renewal Party, which garnered 44 seats in the 1993 general election. He served as Minister for Foreign Affairs in the cabinet of Morihiro Hosokawa, until the latter resigned after his implication in a banking scandal. Hata then assumed the Prime Ministership, but since the Socialist Party had left the coalition, his minority government was forced to resign in two months as a non-confidence motion against his cabinet was submitted to the House of Representatives. Currently a member of the Democratic Party of Japan, he is now one of the elder politicians of the party. Served as Minister of Agriculture, Forestry and Fisheries (1985–1986, 1988–1989), Minister of Finance (1991–1992), and Minister for Foreign Affairs. Member of the Diet from 1969 to 2012. Presided over a coalition that consisted of the Liberal Democratic Party, the Socialist Party, and the New Party Sakigake. During his tenure, the Great Hanshin earthquake erupted and a Sarin gas attack on the Tokyo subway occurred that left 13 dead. He resigned after his party suffered defeat in the 1996 general election. Served as General Secretary of the Socialist Party. Member of the Diet from 1972 to 2000. He spearheaded widespread reforms during his tenure, including reforms to restructure the health, finance, and the bureaucratic system. He resigned after his party suffered massive defeat in the 1998 House of Councilors Election. He died in 2006. Served as Minister of Health (1978–1979), Minister of Transportation (1986–1987), Minister of Finance (1989–1991), Minister of Economy, Trade and Industry (1994–1996). Member of the Diet from 1963 to 2005. His government was credited with stimulating the economy after a depression caused by the bubble crash. After suffering from a stroke, he fell into a coma on 3 April, and died on 14 May 2000. Chief Cabinet Secretary Aoki Mikio served as Deputy Prime Minister until 5 April. Served as Chief of the Okinawa Development Agency (1979–1980), Minister of the Prime Minister's Office (1979–1980), Chief Cabinet Secretary (1987–1989), and Minister for Foreign Affairs (1997–1998). Member of the Diet from 1963 to 2000. His appointment was decided after a secret meeting by major power brokers within the Liberal Democratic Party after the unexpected death of Prime Minister Keizo Obuchi. His gaffes and his government's low legitimacy was detrimental to his government's approval ratings, for which he resigned in 2001. Served as Minister of Education (1983–1984), Minister of Economy, Trade and Industry (1992–1993), Minister of Construction (1995–1996). Member of the Diet from 1969 to 2012. Resigned due to term limits of the Presidency of the Liberal Democratic Party. Served as Vice Minister of Finance (1979), Minister of Health and Welfare (1988–1989), Minister of Posts and Telecommunications (1992), Minister of Health and Welfare (1996–1998), and Minister of Foreign Affairs (2002). Member of Diet from 1972 to 2009. Resigned after suffering from low approval ratings and poor health. Served as Chief Cabinet Secretary (2005–2006). Member of Diet since 1993. Resigned after asserting the need to improve the flow of the political process. Served as Minister for Okinawa Development (2000), Chief Cabinet Secretary (2000–2004), and Minister of State for Gender Equality and Social Affairs (2001–2004). Member of Diet from 1990 to 2012. Resigned after the 2009 general election to accept the responsibility for the worst defeat of the history of the Liberal Democratic Party. Served as Director of Economic Planning Agency (1996–1997), Minister in charge of Economic and Financial Policies (2001), Minister of Internal Affairs and Communications (2003–2005), Minister of Foreign Affairs (2005–2007), and Deputy Prime Minister and Minister of Finance (since 2012). Member of Diet since 1979. Won a majority in the 2009 general election defeating Tarō Asō (LDP). Resigned after breaking a campaign promise to close Marine Corps Air Station Futenma in Okinawa Prefecture. Member of Diet from 1986 to 2012. Resigned due to poor approval ratings after the 2011 Tōhoku earthquake and tsunami and Fukushima Daiichi nuclear disaster. Served as Minister of Health and Welfare (1996), Deputy Prime Minister of Japan (2009–2010), Minister of State for Economic and Fiscal Policy (2009–2010), Minister of State in charge of National Strategy (2009–2010), Minister of State for Science and Technology Policy (2009–2010), and Minister of Finance (2010). Member of Diet since 1980. Resigned after the 2012 general election to accept the responsibility for the defeat of the Democratic Party. Served as Senior Vice Minister of Finance (2009–2010) and Minister of Finance (2010–2011). Member of Diet since 1993. Current Prime Minister of Japan, and first to serve non-consecutive terms since the end of the US occupation. Won a majority in the 2012 general election defeating Yoshihiko Noda (DPJ). Won the 2014 and 2017 general elections retaining a majority in the House of Representatives. Served as the 90th term Prime Minister (2006–2007), Chief Cabinet Secretary (2005–2006). Member of Diet since 1993. (*) The table only includes PMs who have cumulatively served 2 years (730 days) or more. A fully detailed list is available at List of Japanese prime ministers by longevity. As of April 2019, eleven former Prime Ministers of Japan are alive. The most recent death of a former Prime Minister of Japan is that of Tsutomu Hata (as Prime Minister in 1994) on 28 August 2017. Shinzō Abe, who served as Prime Minister from 2006 to 2007, is currently serving (since 2012) and thus isn't included on this list. ^ a b c d 第1•5•7•10代 伊藤 博文 [1st/5th/7th/10th Itō Hirobumi] (in Japanese). Official website of the Prime Minister of Japan. Retrieved 28 May 2012. ^ 第2代　黑田 清隆 [2nd Kuroda Kiyotaka] (in Japanese). Official website of the Prime Minister of Japan. Retrieved 24 May 2012. ^ a b 第3•9代 山縣 有朋 [3rd/9th Yamagata Aritomo] (in Japanese). Official website of the Prime Minister of Japan. Retrieved 28 May 2012. ^ a b 第4•5代 松方 正義 [3rd/9th Matsukata Masayoshi] (in Japanese). Official website of the Prime Minister of Japan. Retrieved 28 May 2012. ^ a b 第8•17代 大隈 重信 [8th/17th Ōkuma Shigenobu] (in Japanese). Official website of the Prime Minister of Japan. Retrieved 28 May 2012. ^ a b c 第11•13•15代 桂 太郎 [8th/17th Katsura Tarō] (in Japanese). Official website of the Prime Minister of Japan. Retrieved 28 May 2012. ^ a b 第12•14代 西園寺 公望 [12th/14th Saionji Kinmochi] (in Japanese). Official website of the Prime Minister of Japan. Retrieved 28 May 2012. ^ a b 第16•22代 山本 權兵衞 [16th/22nd Yamamoto Gonnohyōe] (in Japanese). Official website of the Prime Minister of Japan. Retrieved 28 May 2012. ^ 第18代 寺内　正毅 [18th Terauchi Masatake] (in Japanese). Official website of the Prime Minister of Japan. Retrieved 28 May 2012. ^ 第19代 原 敬 [19th Hara Takashi] (in Japanese). Official website of the Prime Minister of Japan. Retrieved 28 May 2012. ^ 第20代 高橋 是清 [20th Takahashi Korekiyo] (in Japanese). Official website of the Prime Minister of Japan. Retrieved 28 May 2012. ^ 第21代 加藤 友三郎 [21st Katō Tomosaburō] (in Japanese). Official website of the Prime Minister of Japan. Retrieved 28 May 2012. ^ 第23代 清浦 奎吾 [23rd Kiyoura Keigo] (in Japanese). Official website of the Prime Minister of Japan. Retrieved 28 May 2012. ^ 第24代 加藤 高明 [24th Katō Takaaki] (in Japanese). Official website of the Prime Minister of Japan. Retrieved 28 May 2012. ^ a b 第25•28代 若槻 禮次郎 [25th/28th Wakatsuki Reijirō] (in Japanese). Official website of the Prime Minister of Japan. Retrieved 24 May 2012. ^ 第26代　田中 義一 [26th Tanaka Giichi] (in Japanese). Official website of the Prime Minister of Japan. Retrieved 24 May 2012. ^ 第27代　濱口 雄幸 [27th Osachi Hamaguchi] (in Japanese). Official website of the Prime Minister of Japan. Retrieved 24 May 2012. ^ 第29代　犬養 毅 [29th Inukai Tsuyoshi] (in Japanese). Official website of the Prime Minister of Japan. Retrieved 24 May 2012. ^ 第30代　齋藤 實 [30th Saito Makoto] (in Japanese). Official website of the Prime Minister of Japan. Retrieved 24 May 2012. ^ 第31代　岡田 啓介 [31st Keisuke Okada] (in Japanese). Official website of the Prime Minister of Japan. Retrieved 24 May 2012. ^ 第32代　廣田 弘毅 [32nd Koki Hirota] (in Japanese). Official website of the Prime Minister of Japan. Retrieved 24 May 2012. ^ 第33代　林 銑十郎 [33rd Senjuro Hayashi] (in Japanese). Official website of the Prime Minister of Japan. Retrieved 24 May 2012. ^ a b 第34•38•39代 近衞 文麿 [34th/38th/39th Fumimaro Konoe] (in Japanese). Official website of the Prime Minister of Japan. Retrieved 24 May 2012. ^ 第35代　平沼 騏一郎 [35th Hiranuma Kiichiro] (in Japanese). Official website of the Prime Minister of Japan. Retrieved 24 May 2012. ^ 第36代　阿部 信行 [36th Nobuyuki Abe] (in Japanese). Official website of the Prime Minister of Japan. Retrieved 24 May 2012. ^ 第37代　米内 光政 [37th Mitsumasa Yonai] (in Japanese). Official website of the Prime Minister of Japan. Retrieved 24 May 2012. ^ 第40代　東條英機 [40th Hideki Tojo] (in Japanese). Official website of the Prime Minister of Japan. Retrieved 24 May 2012. ^ 第41代　小磯國昭 [41st Kuniaki Koiso] (in Japanese). Official website of the Prime Minister of Japan. Retrieved 24 May 2012. ^ 第42代　鈴木貫太郎 [42nd Kantaro Suzuki] (in Japanese). Official website of the Prime Minister of Japan. Retrieved 24 May 2012. ^ 第43代　東久邇宮稔彦王 [43rd Higashikuni Naruhiko] (in Japanese). Official website of the Prime Minister of Japan. Retrieved 24 May 2012. ^ 第44代　幣原喜重郎 [44th Kijuro Shidehara] (in Japanese). Official website of the Prime Minister of Japan. Retrieved 24 May 2012. ^ a b 第45•48•49•50•51代 吉田 茂 [45th/48th/49th/50th/51st Shigeru Yoshida] (in Japanese). Official website of the Prime Minister of Japan. Retrieved 24 May 2012. ^ 第46代　片山 哲 [46th Tetsu Katayama] (in Japanese). Official website of the Prime Minister of Japan. Retrieved 24 May 2012. ^ 第47代　芦田 均 [47th Hitoshi Ashida] (in Japanese). Official website of the Prime Minister of Japan. Retrieved 24 May 2012. ^ 第52•53•54代　鳩山 一郎 [52nd/53rd/54th Sosuke Uno] (in Japanese). Official website of the Prime Minister of Japan. Retrieved 24 May 2012. ^ 第55代　石橋 湛山 [55th Tanzan Ishibashi] (in Japanese). Official website of the Prime Minister of Japan. Retrieved 24 May 2012. ^ 第56•57代　岸信介 [56th/57th Nobusuke Kishi] (in Japanese). Official website of the Prime Minister of Japan. Retrieved 24 May 2012. ^ 第58•59•60代　池田 勇人 [58th/59th/60th Hayato Ikeda] (in Japanese). Official website of the Prime Minister of Japan. Retrieved 24 May 2012. ^ 第61•62•63代　佐藤 榮作 [61st/62nd/63rd Eisaku Sato] (in Japanese). Official website of the Prime Minister of Japan. Retrieved 24 May 2012. ^ 第64•65代　田中 角榮 [64th/65th Kakuei Tanaka] (in Japanese). Official website of the Prime Minister of Japan. Retrieved 24 May 2012. ^ 第66代　三木 武夫 [66th Takeo Miki] (in Japanese). Official website of the Prime Minister of Japan. Retrieved 24 May 2012. ^ 第67代　福田 赳夫 [67th Takeo Fukuda] (in Japanese). Official website of the Prime Minister of Japan. Retrieved 24 May 2012. ^ 第68•69代　大平 正芳 [68/69th Masayoshi Ohira] (in Japanese). Official website of the Prime Minister of Japan. Retrieved 24 May 2012. ^ 第70代　鈴木 善幸 [70th Zenkō Suzuki] (in Japanese). Official website of the Prime Minister of Japan. Retrieved 24 May 2012. ^ 第71•72•73代　中曽根 康弘 [71st/72nd/73rd Yasuhiro Nakasone] (in Japanese). Official website of the Prime Minister of Japan. Retrieved 24 May 2012. ^ 第74代　竹下 登 [74th Noboru Takeshita] (in Japanese). Official website of the Prime Minister of Japan. Retrieved 24 May 2012. ^ 第75代　宇野　宗佑 [75th Sosuke Uno] (in Japanese). Official website of the Prime Minister of Japan. Retrieved 17 May 2012. ^ 第76•77代　海部　俊樹 [76th/77th Toshiki Kaifu] (in Japanese). Official website of the Prime Minister of Japan. Retrieved 17 May 2012. ^ 第78代　宮澤　喜一 [78th Kiichi Miyazawa] (in Japanese). Official website of the Prime Minister of Japan. Retrieved 17 May 2012. ^ 第79代　細川　護煕 [79th Morihiro Hosokawa] (in Japanese). Official website of the Prime Minister of Japan. Retrieved 17 May 2012. ^ 第80代　羽田　孜 [80th Tsutomu Hata] (in Japanese). Official website of the Prime Minister of Japan. Retrieved 17 May 2012. ^ 第81代　村山　富市 [81st Tomiichi Murayama] (in Japanese). Official website of the Prime Minister of Japan. Retrieved 17 May 2012. ^ 第82•83代　橋本　龍太郎 [82nd/83rd Ryutaro Hashimoto] (in Japanese). Official website of the Prime Minister of Japan. Retrieved 17 May 2012. ^ 第84代　小渕　恵三 [84th Keizo Obuchi] (in Japanese). Official website of the Prime Minister of Japan. Retrieved 17 May 2012. ^ 第85•86代　森　喜朗 [85th/86th Yoshiro Mori] (in Japanese). Official website of the Prime Minister of Japan. Retrieved 17 May 2012. ^ 第87•88•89代　小泉　純一郎 [87th/88th/89th Junichiro Koizumi] (in Japanese). Official website of the Prime Minister of Japan. Retrieved 17 May 2012. 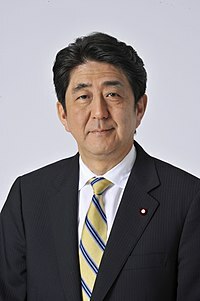 ^ a b 第90•96•97代　安倍　晋三 [90th/96th/97th Shinzo Abe] (in Japanese). Official website of the Prime Minister of Japan. Retrieved 17 May 2012. ^ 第91代　福田　康夫 [91st Yasuo Fukuda] (in Japanese). Official website of the Prime Minister of Japan. Retrieved 17 May 2012. ^ 第92代　麻生　太郎 [92nd Tarō Asō] (in Japanese). Official website of the Prime Minister of Japan. Retrieved 17 May 2012. ^ 第93代　鳩山　由紀夫 [93rd Yukio Hatoyama] (in Japanese). Official website of the Prime Minister of Japan. Retrieved 17 May 2012. ^ 第94代　菅 直人 [94th Naoto Kan] (in Japanese). Official website of the Prime Minister of Japan. Retrieved 17 May 2012. ^ 第95代　野田 佳彦 [95th Yoshihiko Noda] (in Japanese). Official website of the Prime Minister of Japan. Retrieved 26 December 2012. This page was last edited on 11 April 2019, at 17:36 (UTC).